Cuff Weights and Dumbells are sold separately. 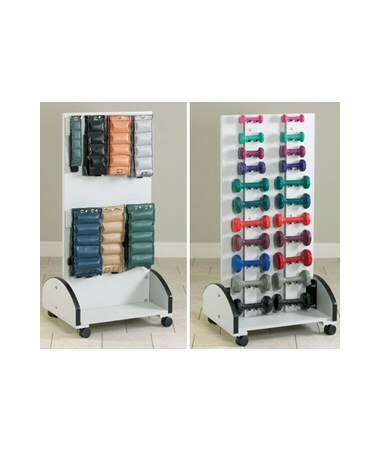 The Clinton Industries Merit Series Cuff & Dumbbell Mobile Weight Rack is a movable storage device designed to hold up to 32 cuff weights and 22 dumbbells. It is an ideal choice for any exercise, physical therapy, and rehabilitation facility in need of multiple storage and hassle-free transport. Awesome Design. 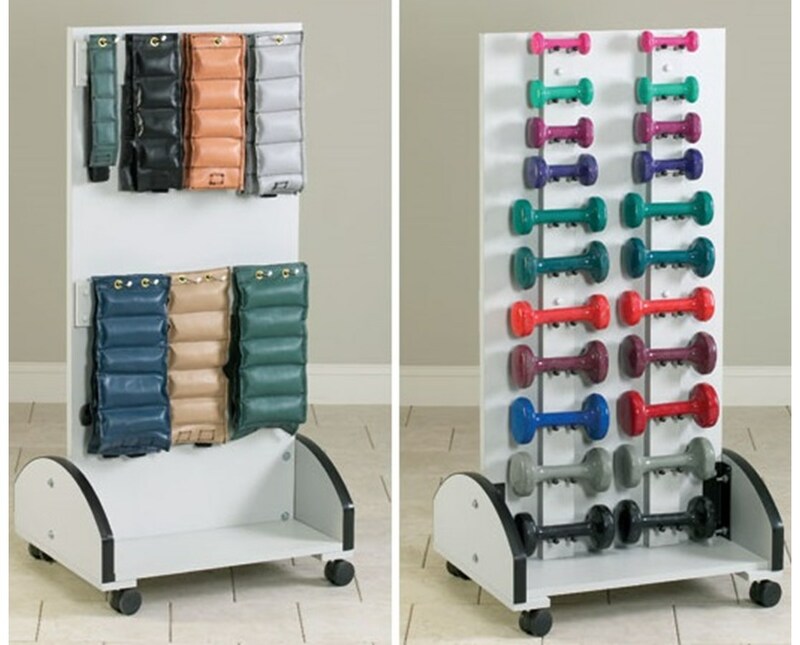 Made with a solid surface, the Merit Series Cuff & Dumbbell Mobile Weight Rack has no pegboard to chip and its all laminate construction is easy to clean. It features a cuff weight sliding hook system that provides quick and hassle-free lateral positioning and its included dumbbell rods are angled for added stability & is made with a strong polycarbonate. Protected and Hassle-free Transport. With 3" swivel casters, the Mobile Cuff & Dumbbell Rack can easily be moved around the facility and because of its protective bumper molding around its base, prevents damages and scuffs to the rack itself. The Clinton Industries Merit Series Cuff & Dumbbell Mobile Weight Rack comes in a size of 25" W x 19" D x 53" H and various laminate colors.